It’s less than a year since I first saw Sound of the Sirens doing a support set for Mad Dog Mcrea at The Half Moon in Putney. 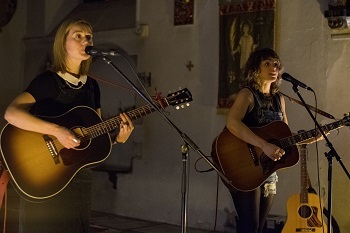 It’s been an eventful ten months for Abbe and Hannah, with festival appearances and a headline show in their home town of Exeter, and this time around they were headlining a sellout gig at St Pancras Old Church, so absolutely no pressure at all. The venue was a pretty inspired choice; it’s an intimate setting but big enough to cope with the full dynamic range of Sound of the Sirens, from a cappella to two guitars, two voices and percussion. The stage was lit by a bedside lamp at either side, creating a cosy ambience which worked well for the performers. Annie Rew Shaw, also from Devon, was first on stage, playing her melancholic piano-backed songs of sorrow and loss, helped out by an occasional bit of fiddle accompaniment. The songs, and Annie’s fabulous voice, got a good response from an appreciative audience. Tom Figgins was up next; again the songs were good and Tom’s swooping, soaring delivery kept the audience enthralled throughout his set. Both support sets were really strong performances, building up towards the headliners without threatening to steal their thunder. The runaway train that Sound of the Sirens were riding for most of last year could have been derailed at any time if they hadn’t been prepared for it, but they took everything in their stride and looked completely unfazed by their increasing popularity. Becoming a headline attraction almost overnight (after years of hard work) is a huge challenge that Abbe and Hannah seem to be dealing with pretty well at the moment. Wednesday’s gig was a ninety minute set, a huge leap from the tight thirty minute support sets they’ve been doing for so long. A lot of bands with one album would struggle to find material to fill an extra hour, but with an album, three EPs and a constant stream of new songs, they made it look like the easiest thing in the world. They both like to interact with the audience and their intriguingly random humour builds a strong rapport between songs as guitars are swapped and mandolins retuned. They took the opportunity that the longer set presented to build up the momentum, ease back a little and then build again to a barnstorming climax with the live favourites “The Gift” and “Together Alone”. The rest of the set was a mix of songs from the three EPs (including “The Fear”, “Next Year”, “All That I Could Find” and “Stars”) the album “A Long Way to Fall” (including “The Night Before”, “Up to the House” and the magnificent “Faith in Fire”) and a few surprises. There was a cover of The Maccabees “Pelican” and a few new (or unrecorded) songs including “Best Intentions, “For All Our Sins”, “Cross Our Hearts” and “Smokescreen”. Any nervousness that Abbe and Hannah had before the gig didn’t last very long. It’s fair to say that the audience were onside right from the start but, by the end of the night, the potent mix of well-crafted and powerful songs, superb harmonies and counterpoint and sheer enthusiasm sent everyone home buzzing. I suspect it won’t be too long now before Sound of the Sirens will be playing in a venue near you.